(Phys.org) -- Robotics researchers in Spain and the U.S. are studying bats for their design work on drones. Bat wings are highly articulated, with skeletons similar to those of human arms and hands. The researchers have built a drone that mimics the way a bat changes its wing shape in flight. Bats achieve an amazing level of maneuverability, says a researcher, mainly because of their capacity of changing wing morphology during flight. Specifically, the "Batbot" replicates the way a bat changes the profile of its wing between the downstroke and upstroke. By folding wings toward their bodies on the upstroke, bats use 35 percent less energy and reduce aerodynamic drag, according to researchers at Brown. The design is said to be encouraging, as an example of how robot construction can move from rigid components toward bionic systems made from softer materials and artificial muscles. The interest in bats is because of the way bats change the shape of their wings, which has potential for improving the maneuverability of these air devices. Julian Colorado and colleagues at the Polytechnic University of Madrid, Spain and at Brown University in Providence, Rhode Island, built the drone with an end goal in mindmore agile, autonomous robots making more agile moves than can fixed wing aircraft. Colorado said that trying to mimic that level of functionality requires analysis of bat flight and novel technologies, ranging from design to control issues. Colorados team refers to their device officially as the BaTboT robot. They make use of shape memory alloys as muscle like actuators, behaving as biceps and triceps along the wing-skeleton structure of the robot. The wing extends and contracts under the control of the shape-memory alloy wires that switch between two shapes when different currents are applied. The wires, between the "shoulder" and "elbow" of the robot, rotate the elbow, pulling in the "fingers" to slim the wing profile on the upstroke. This contracts and extends the wings in a similar way to the biological counterpart, said Colorado. The devices wingspan was inspired by a specific type of bat, the grey-headed flying fox, the largest bat in Australia. Bats have evolved with truly extraordinary aerodynamic capabilities that enable them to fly in dense swarms, to avoid obstacles, and to fly with such agility that they can catch prey on the wing, maneuver through thick rainforests and make high speed 180 degree turns, according to notes from Brown Universitys notes on Bat Flight Research. Why does rain keep bats grounded? Shape memory alloys work as a function of their temperature, which makes them quite slow because you have to heat the bulk of the material and then cool it down to repeat the cycle. It's very difficult to make them move faster than 1-2 Hz unless the wire is extremely thin and feeble. They also have severe efficiency problems, because the wire has to shed heat quickly, which means you also need a lot of power to heat it up. Generally speaking, their efficiencies tend to be less than 25% and usually around 5%. I wonder how they've actually managed to build an actuator that is fast enough to flap a bat's wing, yet uses little enough energy to carry its own batteries. @Eikka. Indeed SMAs are quite inefficient in terms of actuation speed and power consumption but for the application at hand they are not being used to power the primary flapping motion. 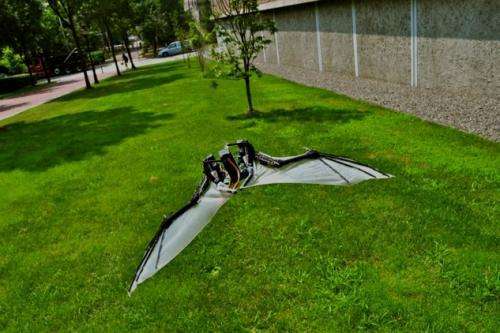 The bat robot is able to flap the wings up to 10Hz using an standard DC motor. SMAs are used to contract and extended the wings in order to maneuver. Each SMA actuator has a mass of 1g allowing for light wings with muscle-like actuation. 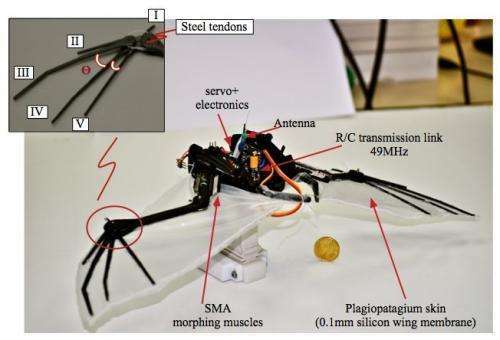 The bat robot is able to flap the wings up to 10Hz using an standard DC motor. SMAs are used to contract and extended the wings in order to maneuver. the "Batbot" replicates the way a bat changes the profile of its wing between the downstroke and upstroke. So they do have to make the actuators move as fast as the wing flaps. Otherwise that won't work. Energy considerations aside, 10 Hz is mighty fast for nitinol wire. One of the things I've learned about the stuff is, that if you want to make it move fast, never forget to cool it. Once the wire starts to go blue on the surface, the memory effect is gone. It's also quite difficult to control accurately, because it tends to creep and stretch depending on the load and the temperature. Wing morphology can be adjusted at maximum of 2.5Hz (limited by the SMA speed). This means the robot is able to change the wing's shape in sync with the flapping motion at maximum frequency of 2.5Hz. However flapping at 2.5Hz is too slow for the generation of lift forces. So at the moment, the idea behind is to flap >2.5Hz (up to 10Hz) and only use the morphing-wing motion to maneuver. Once a cruise speed has been reached (about 3-5m/s), the flapping frequency could be decreased at 2.5Hz and then it would be able to modulate the wings during downstroke and upstroke. What you say is truth, several challenges for improving SMA speed, accuracy, slack issues, etc demand researchers to tackle these issues and do not give up =).